As I was leaving Sydney, the city put on a wonderful end of summer show for me, dressing up the shorter cooler days with sunshine (absent during the wettest March on record), as if to say See, you’ll really miss me. Suddenly there were warm jewel bright days, where the the Harbour and the city both sparkled. And she's right, I will miss her. But the graphic designer and the photographer have been working overtime, and we've made a lot of progress on our Food is Love cookbook, so I left with a feeling of accomplishment. And yes, that is a kangaroo on the Holden in the Jaguar's spot! I returned to Jerusalem to find that spring has sprung, and although the nights are still cool, a hot sun is turning the grass yellow and encouraging nettles to thrive. Best of all, the new season's vegetables have arrived in the markets, including my favourite, the spring garlic. Plus there’s someone who sits peeling the fresh green broad beans for you... Heaven on a stick. I also returned in time for Holocaust Memorial Day. A siren's wail brings Israelis to a standstill, as they stop to remember the six million Jews killed in the Holocaust. It’s extraordinary to see traffic grind to a halt, including buses on highways, and people stand to attention outside their cars. To mark the day, we are sharing a recipe from Food is Love grandmother Lena Goldstein -- melt in your mouth 'bow tie' pastries, which she makes from scratch and by hand, naturally, who needs a food processor or a mixmaster to help you along at 98 years old?!? As well as her recipe, we are also sharing a piece of her writing, a poignant memory of 2 friends who did not survive the Warsaw Ghetto Uprising of 1943. Chrusty in Polish, Crostoli in Italian, these fried pastry bow-ties are popular all across Europe. The secret is a splash of vodka! At 98 years old, Lena Goldstein is the oldest grandmother in this project. She is – touch wood – healthy, vibrant, in fact feisty, involved with her children and grandchildren, still baking, reading, and going out every Saturday morning to meet girlfriends at a café near her home, where they discuss world events as well as family news. And when I say going out - she drives herself there! Lena is taking part in a NSW study on Centenarians though her own good health is a mystery to her, since she knew great deprivation as a young woman during World War Two. Lena was in Warsaw when the Nazis invaded Poland in September 1939. Jews were immediately targeted. The Nazis established a Ghetto where they herded Jews from across Warsaw and its surrounding villages. “It was between 350,000 - 400,000 people and it was quite a small area,” Lena recalls. Overcrowding, hunger and disease became rampant. Lena, her parents and one of her brothers, Salek managed to survive these increasingly harsh conditions. By 1943 Lena and Salek were part of only ten per cent of Warsaw’s Jews – some 40,000 people - still alive. The rest had died of starvation or disease, or had been deported to nearby death camps such as Treblinka. Those murdered there included Lena’s parents. As they waited the final deportations of 1943, some of the young Ghetto leaders decided that if they had to die, they would die fighting. They began planning an Uprising. It turned into the the largest Jewish revolt of World War Two. From early 1943, Lena was working for the Jewish Fighting Organization planning the Uprising. Just before it was scheduled to begin, in April 1943, she was offered a hiding place outside the Ghetto. She wasn’t sure if she should take it. Her brother Salek advised her to go. Perhaps someone from their family would survive. Perhaps it would be Lena. Lena never forgot her brother’s final words. More than seventy years after World War Two, she is still keeping her vow to him, sharing her life story, in a bid to educate against hatred. She was awarded the Order of Australia for this work in 2015. Lena has written about two of her friends, Heniek and Gutek, who did not have the opportunity to escape the Warsaw Ghetto when she did. They had to stay behind to face the Nazi onslaught. Lena fears she may be the only person alive who remembers Heniek – and even she does not know his full name. "One of the greatest tragedies of the Holocaust was that entire families and villages were not only erased from the face of the earth but from history itself. If no member of your family of village survived, there was no one to remember you or the things you did. This is the story of one such hero, who perhaps in the sharing of my memories of him will not be forgotten," says Lena. When they read ‘the names’ his name will not be there. When they mention Mordechai Anielevicz, Antek Cukerman, Zivia Lubetkin and other heroes of the Warsaw Ghetto Uprising, his name won’t be there, though it should be. There is nobody alive who remembers his full name. Even I only know him by his first name: Heniek. I first met Heniek during deportations from the Warsaw Ghetto, when I started working in the Laundry as a washerwoman, washing Nazi uniforms. 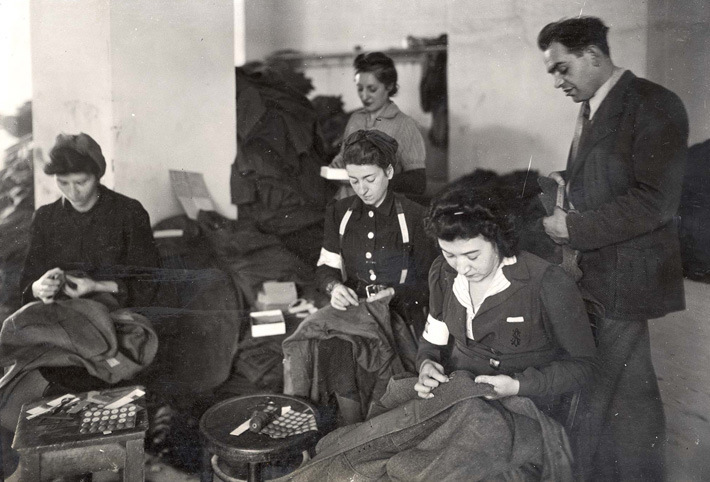 Lena worked in the Warsaw Ghetto Laundry, washing Nazi uniforms. One of her jobs when she was working for the Ghetto Uprising was smuggling uniforms to the Jewish Fighting Organisation. The plan was for Jewish fighters to wear Nazi uniforms in order to confuse the German soldiers when they came to liquidate the Ghetto. Heniek was the Laundry Foreman. To this day I find the title ‘Foreman’ ironic, for in truth he was just a boy of 17. His family had already been taken away on a transport; mine too had been taken. Heniek quickly attached himself to me in a way that reminded me of a puppy. I became his mother confessor, somebody to ask for advice or guidance or to whom he could tell his secrets. He was only a few years younger, but he called me Mamusia (Mummy). I didn’t mind. Heniek’s childhood was a sad one. His father was cruel and sadistic, his mother a battered wife, his sister an assaulted waif. At the age of ten, Heniek had to give up his education and begin to work to support his family. He found work in the dry-cleaning business, where he gained the expertise which would later, temporarily, spare his life. By the time I met him, no one knew better than Heniek how to remove the blood from German uniforms. He made friends with Gutek, my boyfriend at the time, who also worked in the Laundry. One day they failed to turn up at work. With constant Nazi ‘selections’, this in itself was nothing unusual; no one enquired after them. Only I was let into the secret. Both boys had joined the Jewish Fighting Organisation, (JFO) which consisted of a few cells like Betar, Poale Zion, the Bund and the Communists. Theirs was the Communist cell, not because of ideology, but because the Communist cell was located in the attic of the building adjoining the Laundry. In a short time, Heniek became one of the most active members of this group. His assignments were the most dangerous and audacious and although he was the youngest, he led the group. Heniek was modest. His courage was only ever related to me by Gutek. Because of this courage, he was also entrusted with the money collected to purchase revolvers, the only weapons the Jewish Fighters could afford. Some Jewish people in the Ghetto sold their bedding to Poles in exchange for food. They got rid of the feathers, because the bedding covers on their own were easier to smuggle out. The thick whirl of feathers then created became the perfect camouflage for fighters and their weapons. Sometimes I wondered if Heniek’s courage and disregard of danger were due to his youth or perhaps some greater sense of defiance on his part. At one point, I noticed in his attitude a sense of unrest, which he eventually explained to me. In the evenings, the groups would have political discussions on subjects like Marx’s Das Kapital, or ways to build the Communist Utopia. I could not help but smile when thinking about what kind of people we Jews were, when we have been sentenced to death today, we are talking about building Utopia tomorrow. In this area Heniek felt he was inferior to his comrades. “They are using those big words, I don’t even understand their meaning. How can I take part in the discussion?” he asked me. “Why don’t you write down the words you don’t understand and bring them to me so that I can explain them to you? Then you can join in with the others,” I suggested. I don’t remember the exact words, but I can still see before my eyes his big round handwriting, a childlike scrawl betraying that his education had ended at age ten. A day before the Ghetto Uprising, I had the opportunity to sneak across to the Aryan side of Warsaw. Gutek and Heniek came to say goodbye. We knew we would never see each other again. I will never forget the last words that Heniek spoke to me. Lena ends her account there, with Heniek’s last cry of pain. Lena's 'Kennekarte' her Nazi ID document. She took it with her when she escaped the Ghetto in April 1943, although carrying proof of her Jewish identity would have meant death had she been stopped. Heniek and Gutek and Lena’s brother Salek stayed to fight in the Uprising. The Ghetto held out for more than one month – longer than any country in Europe, as Lena points out – before in May 1943, the Nazis razed it to the ground. 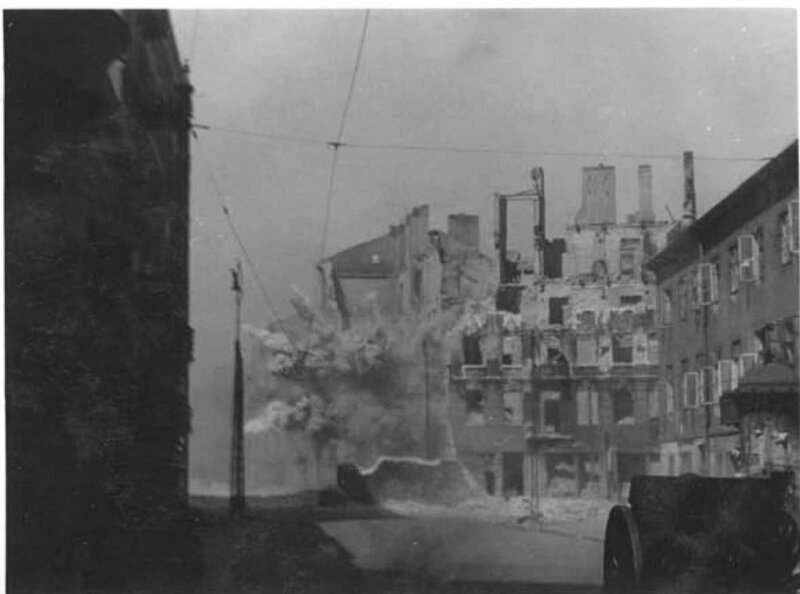 After initially running away in disarray, the Nazis replaced their commander, and destroyed the Ghetto building by building, smoking the fighters out of their bunkers, or bringing the buildings down on top of them. Warsaw Ghetto, May 1943. The sky is black with smoke from burning buildings while captured Jews are moved out for deportation. Approximately 7,000 Jews were killed there. The remainder, some 30,000 people, were captured and deported to concentration and extermination camps, including Treblinka. A few dozen fighters escaped through the sewers. These photos come from the report prepated by Jurgen Stroop, the commander in charge of liquidating the Ghetto. He was a committed and unrepentant Nazi. After destroying the Ghetto, he personally blew up Warsaw’s Great Synagogue. “What a marvelous sight it was. A fantastic piece of theater. My staff and I stood at a distance. I held the electrical device which would detonate all the charges simultaneously. I glanced over at my brave officers and men, tired and dirty, silhouetted against the glow of the burning buildings. After prolonging the suspense for a moment, I shouted: Heil Hitler and pressed the button. With a thunderous, deafening bang and a rainbow burst of colors, the fiery explosion soared toward the clouds, an unforgettable tribute to our triumph over the Jews. The Warsaw Ghetto was no more. The will of Adolf Hitler and Heinrich Himmler had been done," Stroop told his cellmate in a Polish prison, before he was hanged for his crimes. Lena Goldstein is fiercely proud of the Warsaw Ghetto Uprising, and "What a few boys and girls, armed only with revolvers, achieved". She feels this way, even though Heniek, Gutek and her brother Salek did not survive. May their memories be a blessing. To my amazement Lena is still baking, and indeed baked specially for me when I saw her in Sydney. She’s happy to share her recipes. That's how Lena re-created the tastes she remembered from home. This is Lena's signature dish, light, melt-in-your-mouth bow ties made of dough and deep fried. The dough is only very slightly sweet, so the biscuits can be prepared as a savoury dish, and served in soup as they are in Lena’s family. Or they can be served dredged in sugar, as a dessert, as they are across Europe – like the Italian Crostoli - or dredged in honey and spices as they are in Central Asia. One of the wonderful things about this project is seeing how variations on the same dish appear in Jewish homes from country to country! Lena does everything by hand! For those hands aren't as strong as Lena's, the first step can be done in a mix master or food processor. 1. Mix wet ingredients – egg, egg yolks and sour cream, plus vanilla essence and vodka - and then knead in flour, sugar and salt. You want the dough well-combined. 2. Flour your benchtop or a board, and dived the dough into four sections. Using a rolling pin, roll each ball of dough out thinly – to ¼ inch or even 1/8 inch thick. ( 6mm – 3 mm) As thin as you can get, but still sturdy enough to fold. 3. Cut out rectangles, about 3 inches by 1 inch (7.5 cm by 2.5 cm) Lena does this just by sight. You can give that a try, or use a ruler. 4. Cut a small slit, lengthways, in the centre of each rectangle and push one end through it, to make a bow. 5. Deep fry in hot oil. Watch carefully, they are quite easy to burn! Once the oil is hot, it helps to turn the heat down. 6. Rest on paper towels. If making the sweet version, dredge with icing sugar.